The Moors were originally a nomadic people, the original inhabitants of Mauretania on the north coast of Africa. They rose from obscurity in the 8th century when they converted to Islam, and proceeded to spread rapidly in several directions - including north-west into the Iberian peninsula. 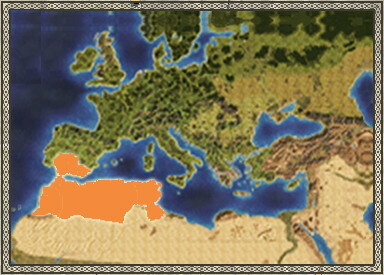 They soon had almost total dominion over all of Iberia with the exception of the lands to the north where some resilient Christians held fast, but Islamic Spain was a collection of cities more than a true caliphate - until now.The Almoravid Berbers have risen from their homelands near the west coast of Africa to establish their capital in Marrakesh, and assume control of the Moorish empire. Their dominance over this corner of Africa is absolute, and the sense of unity they have brought to the Moorish empire has once again restored order in southern Iberia. This move for stable Islamic rule is however also the cause of the greatest threat to the Moors... Christian unity.Once weak, uncultured and disorganised, the kingdoms of Leon and Castile are now unified in their challenge against Islamic rule of the peninsula, and look set to actually launch a genuine offensive to revive their Reconquista. Their heroes such as El Cid are extremely admirable adversaries, as men who are driven with what they believe to be a noble purpose always are.Perhaps the best course of action for the Moors is to play the rulers of Portugal and Castile against one another. So long as they are united in a religious crusade against Islam they are the Moors' greatest threat. Of course, the greed of Christian leaders is something that can be counted upon, and siding with one of these two powers could be possible even if it is undesirable. It is an option they must keep in mind, for expanding too far eastward towards Arabia involves taking on other followers of Islam such as the Egyptians... something most unlikely to be the will of Allah. Mounted on a camel this unit fires a powerful musket called a "jezail'. Fast and manoeuvrable light cavalry units, who hurl their javelins before closing in and fighting with their cavalry swords. Lightly armoured skirmishers, armed with a javelin, and capable of forming a circle formation providing constant fire against the enemy. Recruited in Moorish Iberia, these troops are trained and well equipped heavy cavalry, capable of deadly charges. Christians fighting for the Moors, these elite troops resemble the western knights of the time. These troops combine the crossbow, favoured by Granadine troops, with the Eastern tradition of mobile warfare. Fierce and independent camel riding nomads armed with a spear but lightly armoured. Good for weakening units and breaking up formations, but will quickly dissolve if caught in melee. Wearing little to no armour, but armed with a crossbow these peasants can give far superior troops a nasty surprise. Local militia armed with crossbows and some armour, good for ranged combat, but will melt away in melee. Armed with spears these troops can give attackers a nasty surprise, although they are susceptible to prolonged melee attacks. Fierce and disciplined Saharan Berbers armed with spears. Equipped with a sword, well trained and protected by heavy armour these troops are far superior to most militias. Fearless and hardened light infantry equiped with only a scimitar, effective against other infantry and archers. Tribesmen from Africa armed with swords. These wild Eastern mercenaries are formidable troops ready to fight for whoever can afford them. Can field a good mix of light cavalry and infantry, and effective spears. Lacks strong late period units. A Caravan Stop increases trade, and allows the recruitment of camel cavalry.